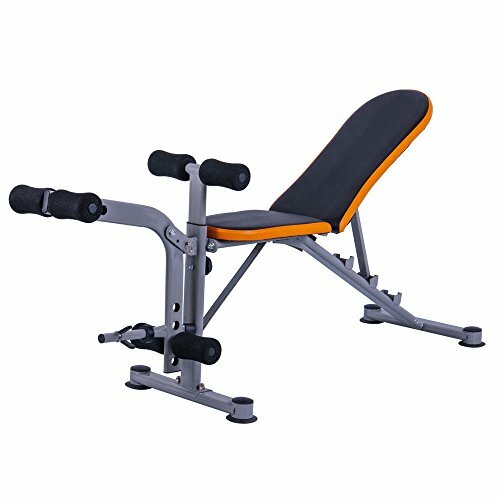 The MGT-4305S Home Foldable Adjustable Flat Incline Decline Dumbbell Weight Bench is ideal for doing dumbbell and abdominal exercises in the comfort of your home. The backrest can be easily adjusted for flat, incline or decline positions for your barbell and dumbbell workouts targeting different muscle groups. Ergonomic design reduces the chances of getting unnecessarily injured while you exercise. Soft, durable leather pad keeps you comfortable during the workout sessions. 1. Ideal for doing dumbbell and abdominal exercises at home. 2. The backrest can be easily adjusted for flat, incline or decline positions. 3. Designed for your barbell and dumbbell workouts targeting different muscle groups. 4. Aid to a great extent in resistance training. 5. Ergonomic design reduces the chances of getting unnecessarily injured. 6. Soft, durable leather pad keeps you comfortable during the workout sessions. 7. Foam rollers will keep you securely in place while you exercise. 8. Steel structure with coated finish, made to last. 9. Non-skid feet for stability. 10. Can be folded for easy storage11. Maximum weight capacity of 100kg. 1. Material: Steel Pipe & Leather Cushion. 2. Color: Black & Gray. 3. Weight: 12kg / 26.46lbs. 4. Dimensions: (44.49 x 16.93 x 5.51)" / (113 x 43 x 14)cm (L x W x H). If you have any questions about this product by GUJJIFUN, contact us by completing and submitting the form below. If you are looking for a specif part number, please include it with your message.